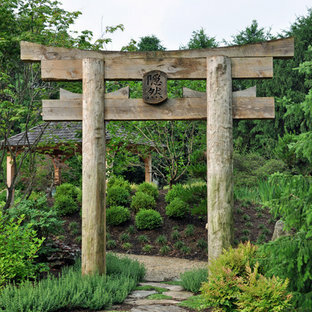 The gateway to the Japanese tea garden style retreat is framed by tree trunk columns milled and dowelled on site by our carpenters. The Asian inscription reads "Hidden Garden". Inspiration for a mediterranean courtyard full sun garden in Austin with gravel and a garden path. 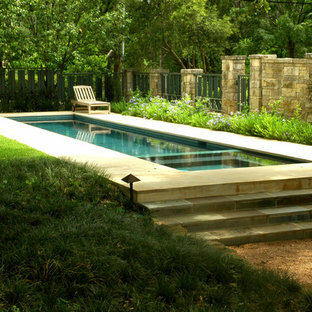 This is an example of a traditional lap pool in Austin. Photo of a tropical backyard shaded garden in Miami. Inspiration for a traditional front yard driveway in Nashville. Our Houston landscaping team was recently honored to collaborate with renowned architectural firm Murphy Mears. 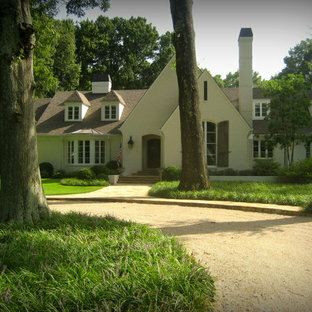 Murphy Mears builds superb custom homes throughout the country. A recent project for a Houston resident by the name of Borow involved a custom home that featured an efficient, elegant, and eclectic modern architectural design. Ms. Borow is very environmentally conscious and asked that we follow some very strict principles of conservation when developing her landscaping design plan. In many ways you could say this Houston landscaping project was green on both an aesthetic level and a functional level. We selected affordable ground cover that spread very quickly to provide a year round green color scheme that reflected much of the contemporary artwork within the interior of the home. 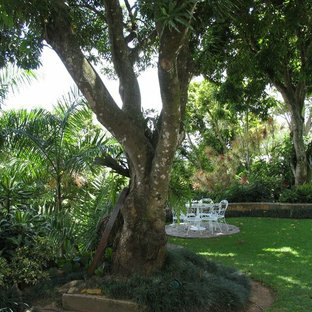 Environmentally speaking, our project was also green in the sense that it focused on very primitive drought resistant plant species and tree preservation strategies. 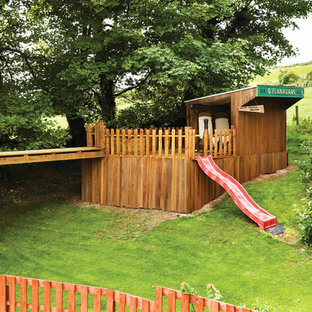 The resulting yard design ultimately functioned as an aesthetic mirror to the abstract forms that the owner prefers in wall art. One of the more notable things we did in this Houston landscaping project was to build the homeowner a gravel patio near the front entrance to the home. The homeowner specifically requested that we disconnect the irrigation system that we had installed in the yard because she wanted natural irrigation and drainage only. The gravel served this wish superbly. Being a natural drain in its own respect, it provided a permeable surface that allowed rainwater to soak through without collecting on the surface. More importantly, the gravel was the only material that could be laid down near the roots of the magnificent trees in Ms. Borow’s yard. Any type of stone, concrete, or brick that is used in more typical Houston landscaping plans would have been out of the question. A patio made from these materials would have either required cutting into tree roots, or it would have impeded their future growth. The specific species chosen for ground cover also bear noting. The two primary plants used were jasmine and iris. Monkey grass was also used to a small extent as a border around the edge of the house. Irises were planted in front of the house, and the jasmine was planted beneath the trees. Both are very fast growing, drought resistant species that require very little watering. However, they do require routine pruning, which Ms. Borow said she had no problem investing in. Such lawn alternatives are frequently used in Houston landscaping projects that for one reason or the other require something other than a standard planting of carpet grass. In this case, the motivation had nothing to do with finances, but rather a conscientious effort on Ms. Borow’s part to practice water conservation and tree preservation. Other hardscapes were then introduced into this green design to better support the home architecture. A stepping stone walkway was built using plain concrete pads that are very simple and modern in their aesthetic. These lead up to the front stair case with four inch steps that Murphy Mears designed for maximum ergonomics and comfort. 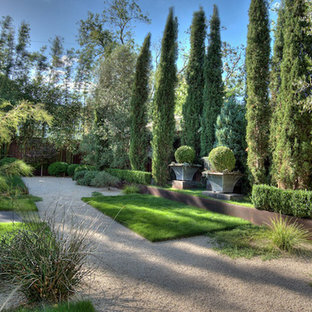 There were a few softscape elements that we added to complete the Houston landscaping design. A planting of River Birch trees was introduced near the side of the home. River Birch trees are very attractive, light green trees that do not grow that tall. This eliminates any possible conflict between the tree roots and the home foundation. 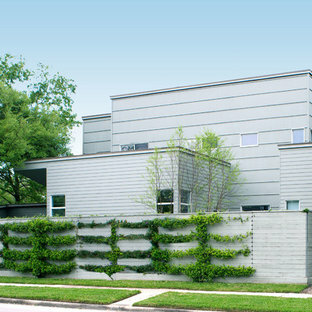 Murphy Mears also built a very elegant fence that transitioned the geometry of the house down to the city sidewalk. The fence sharply parallels the linear movement of the house. We introduced some climbing vines to help soften the fence and to harmonize its aesthetic with that of the trees, ground cover, and grass along the sidewalk. Traditional garden in Other with a container garden. Inspiration for a contemporary garden in Other. 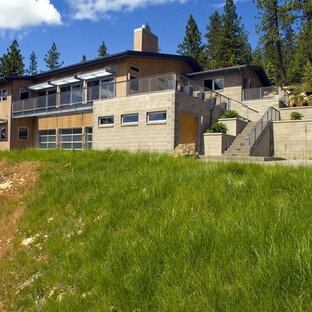 The house was oriented and positioned on the site to take advantage of passive solar strategies. The durable exterior materials convey a substantial, contemporary presence while reducing the need for maintenance and repairs. 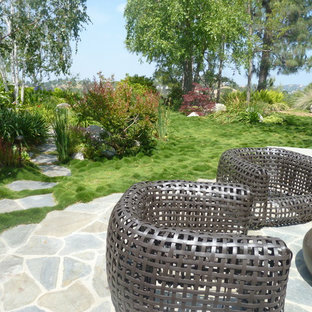 Photo of a large modern backyard garden in Los Angeles with natural stone pavers.